We offer our products with a 180 day money back guarantee. All products are 100% organic and veganic, except Bio-Veg, which is not plant derived. K+AMINO is a biologically active liquid soil amendment for organic gardens and all media types. It is a 100% veganic growth and health promoting liquid microbial inoculant for all plant types, especially suited to fast growing crops such as vegetables, fruits and blooms. K+AMINO contains organic and bacterially activated Nitrogen and organic Potassium growth elements, highly suited to a wide range of plant types. K+AMINO also contains plant available Silicon and a myriad of chelated micro-nutrients, essential for helping our plants maintain internal balance. It promotes healthy, abundant growth particularly in vegetables, fruits and flora though it works equally well for most perennials, trees, shrubs and even picky orchids and ornamentals. 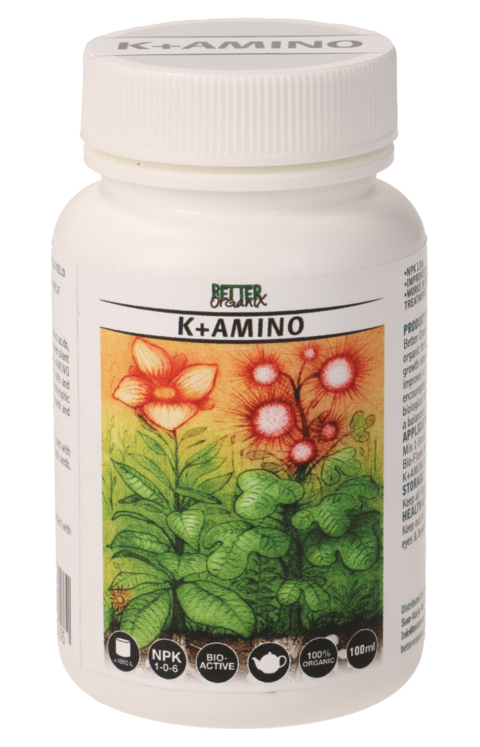 K+AMINO contains phytohormones, enzymes and vitamins, all in natural form and essential for good plant/soil health. Why should I use K+AMINO? K+AMINO has a living biome of both beneficial free ranging soil bacteria, plant associating fungi and molds in both live and spore states. The quantity of aerobic spores is approximately 32/grams of material (dry-weight basis) which is extremely high, ensuring the likelihood of good plant/microbe colonisation. When should I use K+AMINO? K+AMINO really is an all-around growing aid. It can be used on all cycles of plant growth, from seeds as part of a soak and seedlings as a gentle growth promoter, stimulating both root development and above ground branching. It can also be used to stimulate flower production, enhance essential oil production and sugar uptake. The key to this is in the resonant high-quality microbes, plant ready growth compounds and hormones. Abundant chelated organic Calcium and Potassium maintains an extremely high calibre of taste and appearance in foods and blooms and clever microbe modulations improve the shelf life and quality of harvests. K+AMINO helps create nutrient-dense foods, it helps us keep produce fresh for longer, it increases the potency of perfumes and colour of our flora. It does all of this without harming the environment, our water systems, and beyond. It can be used as a major plant feed in high organic media, or in combination with both grow and bloom nutrients from Better Organix and/or other nutrient manufacturers. It is very easy to use requiring no specialist equipment. It is very powerful, entirely safe and hard to over use. How do I use K+AMINO? Adding 0.5 to 1ml/L of chlorine free water once a week is more than enough for most plant types. More nutrient-responsive plants can go as high as 5ml/L but this is rare. It is hard to burn or overfeed. However, we advise you start with the lower dose and work upwards as you feel you need. K+AMINO is versatile, it can be used as a simple soil drench in a watering can, added to automatic feeding systems and applied as a leaf foliar. When applying as a foliar, it can be added on its’ own to great and near instant effect, or to other leaf based treatments and organic wetting agents, we advise bi-weekly treatments when foliar feeding K+AMINO. What media types are suitable for K+AMINO? 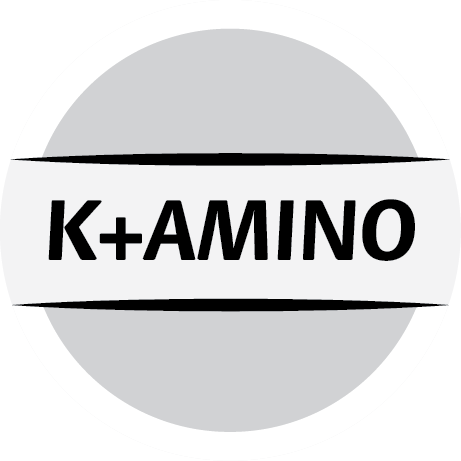 K+AMINO can be used on all media types, from soil to hydro. What is the pH range of K+AMINO? The pH value of K+amino is between 5.4 – 6.0. The product contains live bacteria and so over time as colonies grow and biofilm levels increase, the pH of the liquid can rise. This is a natural process and occurs in all bacterial systems since they modulate the local environment to best suit their function. If this happens, simply adjust the pH of the watering solution using Citric acid or another pH down product before application on acid-loving plants.